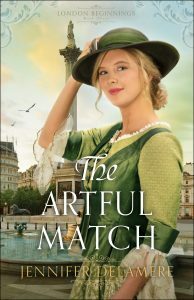 I’m so happy that The Artful Match is now out in the world, and is available at bookstores and eReaders near you! 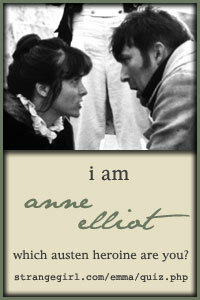 All this week, I’m sharing photos on Facebook of pictures that I used as inspiration for The Artful Match. I hope you’ll stop by and enjoy learning more about the background of this book. If you are in the area of Raleigh/Durham, North Carolina, I’m holding a painting party to celebrate the release of THE ARTFUL MATCH! Because the heroine of the book, Cara Bernay, is an artist, I thought it would be fun to dive into the painting experience for a few hours. We’ll be making a painting of Cape Hatteras Lighthouse, a beloved symbol of North Carolina. There is a tie-in of sorts to THE ARTFUL MATCH. The story includes a hurricane — something we North Carolinians are very familiar with! — and a shipwreck, which lighthouses are of course designed to prevent. Everything you need to make the painting is provided, including instruction, and every participant will receive an autographed copy of THE ARTFUL MATCH. There will also be snacks and beverages provided, and the facility offers wine and beer for sale. Doors open at 2:30 for socializing, and the painting starts at 3 pm. Cost is $35 per person. To reserve your spot, be sure to sign up HERE. MORE FUN NEWS! My website is currently under construction (in the background). I’ll have a new website up soon, with a fresh look and fun links for you to enjoy. My thanks to all the readers who have enjoyed these books! Happy reading! Posted in Uncategorized | Comments Off on Release Day Updates! The Artful Match releases April 2! The Artful Match is available for preorder at your favorite retailer, including Barnes & Noble, Amazon, iBooks, Lifeway, and ChristianBook.com. Look for news soon regarding upcoming book launch events, in person and online. I’m excited to be sharing this story with you! Cara Bernay has never found a place to fit in or to thrive. At loose ends in London after a near-tragedy costs her a job, Cara befriends a rising young artist. With his help, she begins planning a new life and developing her own artistic talent. But soon Cara finds herself at odds with the artist’s brother–a handsome but serious-minded earl who wants to force his brother back to a “respectable” life. Posted in Uncategorized | Comments Off on The Artful Match releases April 2! eBook of THE HEART’S APPEAL is on sale for $1.99! THE HEART’S APPEAL is on sale this month for $1.99. Pick up a copy soon, and enjoy! Posted in Uncategorized | Comments Off on eBook of THE HEART’S APPEAL is on sale for $1.99! Edits for The Artful Match are nearly done! I’m excited to share the cover and a bit about the book. Cara Bernay has never fit in. At loose ends in London after a near tragedy costs her a job, she is befriended by a rising young artist. With his help, she begins planning a new life and developing her own artistic talent. But soon Cara finds herself at odds with the artist’s brother–a handsome but arrogant earl forcing his brother back to a “respectable” life. More details to follow soon, once I have emerged from the editing cave! Posted in Uncategorized | Comments Off on The Artful Match! 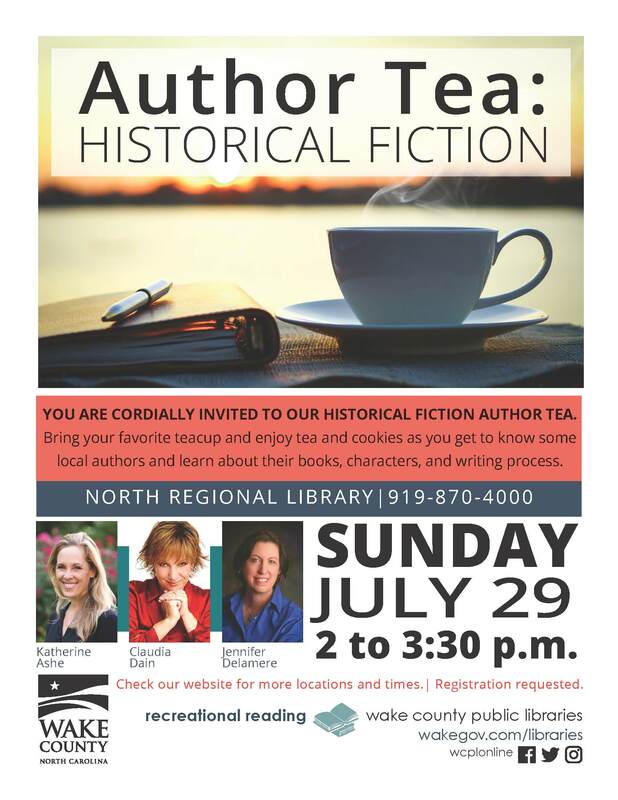 I’m excited to be part of two Author Tea events for Wake County Libraries in July. These events are at 2 pm at the locations listed in the posters below and to the right of this page. Enjoy tea and treats as we chat about books and take your questions. 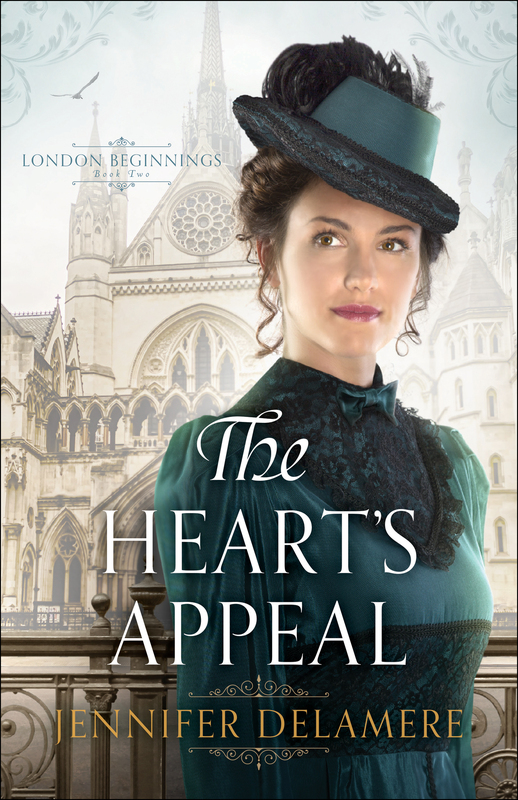 Release Day for THE HEART’S APPEAL! In The Heart’s Appeal, Julia Bernay comes to London to attend medical school and become a certified physician, an occupation that has only recently opened up to women. When she witnesses a serious accident, her quick action saves the life of an ambitious young barrister named Michael Stephenson. It’s only later that she learns he could be instrumental in destroying her dreams for the future. His latest case puts him in the middle of a debate over the future of the women’s medical school. Michael soon discovers he’s met a woman every bit as stubborn and determined to make her mark on the world as he is. Sparks fly—but will they find common ground? 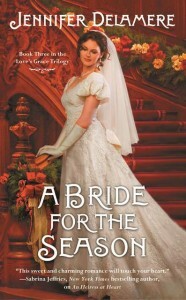 By the way, the background on the book’s cover is the Royal Courts of Justice in London. You can find other photos I used for inspiration for The Heart’s Appeal, on my Pinterest page. 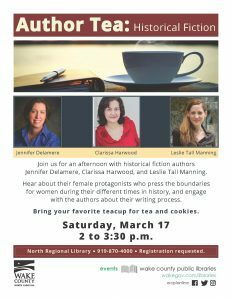 I’m happy to announce this upcoming event on March 17 at 2 pm at the Wake County North Regional Library in Raleigh, NC: an author tea! 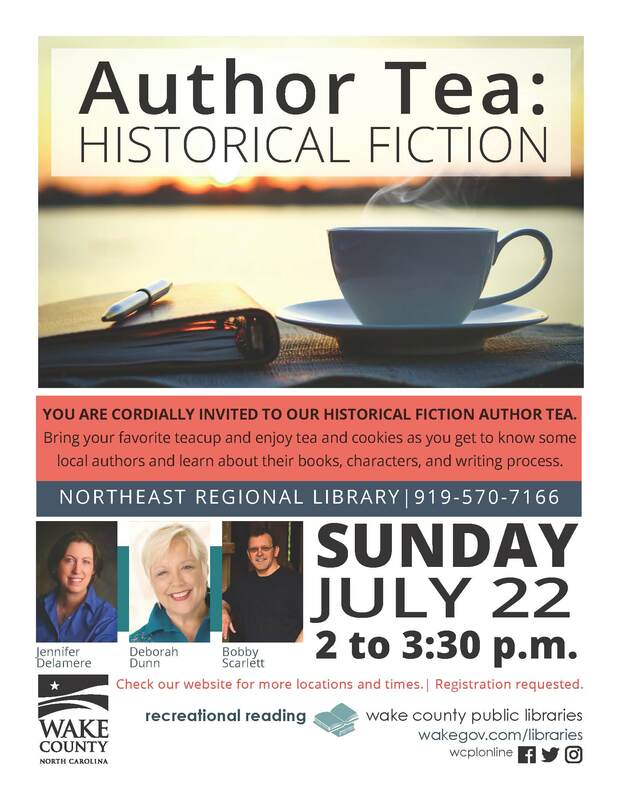 Bring your favorite tea cup — there will be tea and cookies and great conversation. I’ll be o n a panel with two other historical novelists, Clarissa Harwood and Leslie Tall Manning. Our books are very different and are set in different time periods (Victorian, Edwardian, and World War II), but each has a theme of women who are pressing the boundaries for women during their time. We will discuss that aspect of our books, and also answer audience questions. There will be door prizes, swag, and a book signing. I’ll be posting more about this soon. I am currently in “writer’s cave” mode as I finish up my next book. Hope to see lots of you in March! Posted in Uncategorized | Comments Off on Author Tea! 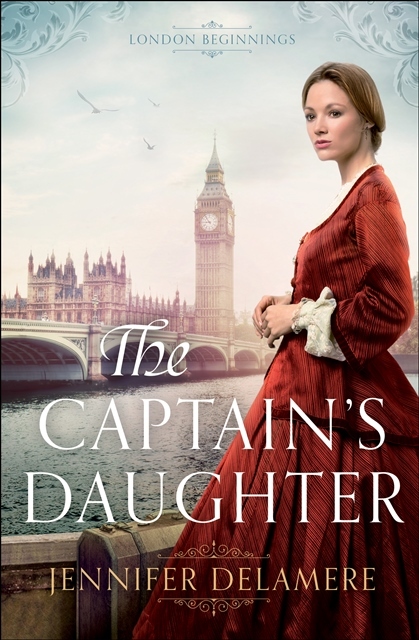 There’s a Goodreads giveaway for The Captain’s Daughter going on during the month of November. Now that’s something to be thankful for! 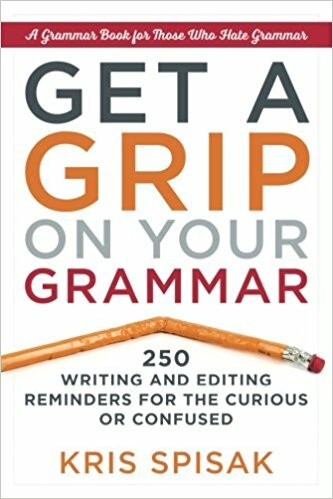 I’m excited to have been invited to join the panel for author Kris Spisak’s “Grammartopia”—an event described as: A game-show style panel in the vein of “Wait, Wait, Don’t Tell Me,” where three panelists battle it out over their language-use savvy in this entertaining and educational program. Audience prizes will be awarded as well. If you don’t think grammar can be fun, check out this video of a previous Grammartopia event! “Grammartopia” will held at 3:00 p.m. on Sunday, November 19, at the Durham County South Regional Library, 4505 S. Alston Ave, Durham, NC 27713. Posted in Uncategorized | Comments Off on Grammartopia! 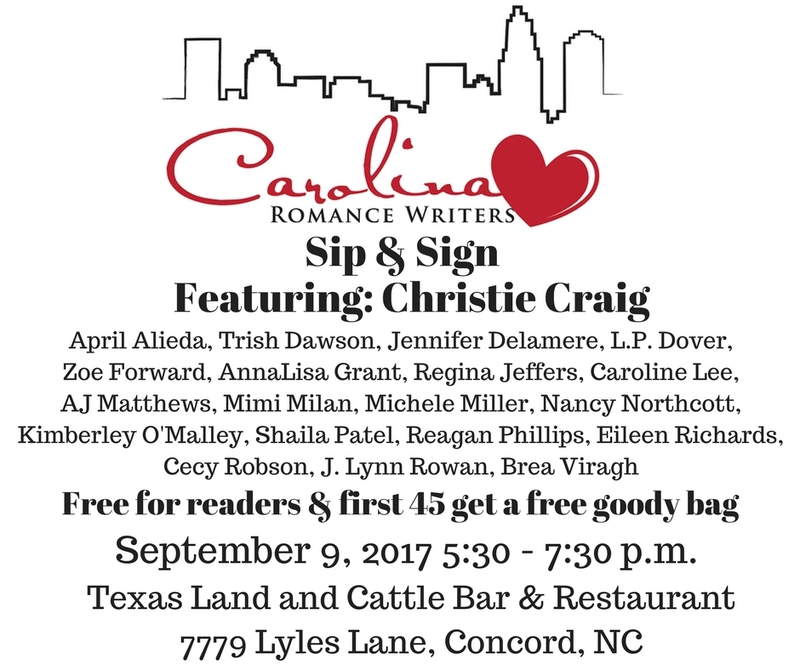 “Sip & Sign” event September 9! Get ready for an evening of fun! 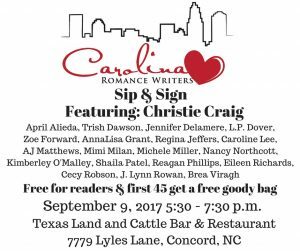 The Carolina Romance Writers Sip & Sign event is a multi-author book signing bringing romance authors and readers together for a couple of hours of fun over good food and beverages. Free to attend, and first 45 attendees will receive a free goody bag! I’ll have copies of The Captain’s Daughter, as well as books from the Love’s Grace trilogy. I would love to see you there! Posted in Uncategorized | Comments Off on “Sip & Sign” event September 9!